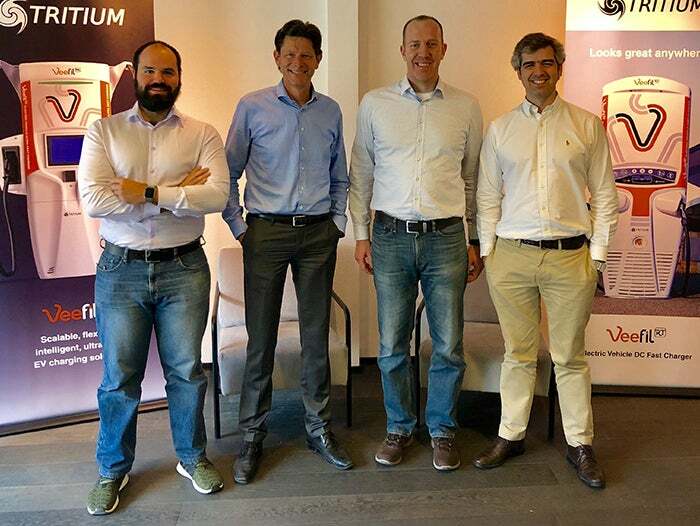 From left to right: Tamas Binder (IT Operations Leader), Jeroen Jonker (General Manager Sales Europe Tritium), Szabolcs Balogh (Managing Director NKM Mobiliti), Manuel Fernandes (General Manager Operations Europe, Business Development Tritium). 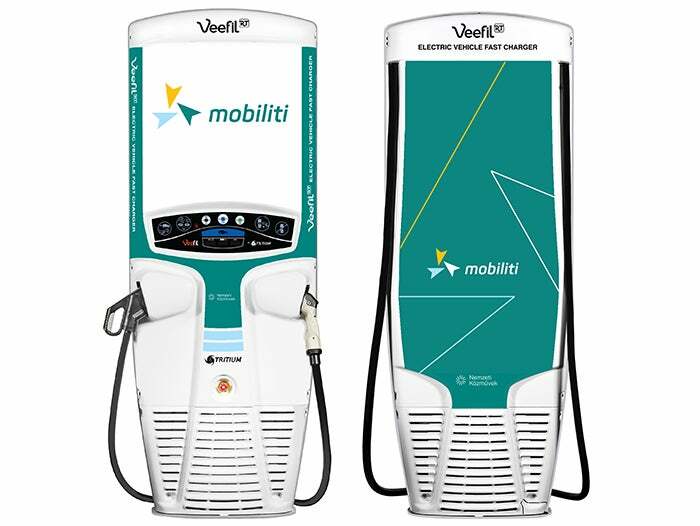 Amsterdam, the Netherlands 17 July 2018: NKM Mobilitas Ltd. (Mobiliti) in Hungary recently ordered the first 12 Veefil-RT 50kW DC fast chargers from Tritium, the leading international specialist in DC charging infrastructure solutions for the electric vehicle (EV) market. The 12 Veefil-RT 50kW DC fast chargers are part of a larger roll-out of NKM’s new electric car charging network across Hungary. NKM Mobilitas Ltd. is a subsidiary of National Utilities, the state Hungarian utilities provider which supplies gas and electricity to 4.2 million households in Hungary. By the end of 2018, it plans to install 100 e-chargers, under the name of Mobiliti, across the country, in cooperation with local government and municipalities. While the EV market in Hungary is currently small, only making up approximately 6,000 of the 3.8 million cars on the country’s roads, it is growing rapidly with EV sales representing 5.1% of all new car sales in quarter one of 2018. Owners of electric cars are supported by generous subsidiaries and incentives from the Hungarian Government, including grants of up to €5,000, free car registration and reduced or free parking. “We want to establish a network covering the whole country. Although today, it is mainly companies that are buying electric cars, 80-85 percent of the charging takes place in homes or underground parking garages. Only pproximately five percent of charging points are located on autoroutes or motorways with the rest in public areas," said Szabolsc Balogh, Managing Director NKM Mobilitas Ltd.
NKM Mobilitas Ltd. turned to Tritium for chargers for fast charging along the main traffic routes. Their first orders – a total of 12 Veefil-RT 50kW DC fast chargers – were placed in quarter two of 2018. These fast chargers will be installed in strategic locations across Hungary in the second half of 2018. “The Tritium fast chargers are strategically vital to our charging network vision,” says Balogh. “The Tritium chargers are around 25 times faster than home chargers. They were also recommended by Fortum Charge & Drive, whose software underpins our charging network. We were impressed with the Veefil-RT’s small footprint and light weight – it only weighs about 170kg compared to up to 600kg for other 50kW fast-chargers. Additionally, the use of liquid cooling technology will reduce future maintenance requirements. There is no need for regular filter replacement as is common with air cooled fast chargers. ” Mobiliti is also looking into charging solutions for B2B customers, including retail networks, shopping centres, bank offices delivery businesses and transporters. The new European headquarters will bring service, support, sales, training, and manufacturing of its EV fast-charging solutions closer to European customers. Additionally, the new Dutch office houses a state-of-the-art training and accreditation unit for technical servicing and customer support, which includes comprehensive and confidential testing facilities open to all European car manufacturers. The NKM Nemzeti Közművek Zrt. (“National Utilities Ltd.”) tasks are to ensure a unique, central management of the national utility services, to establish the national public utility services and to provide a long-term, sustainable operation thereof in the natural gas, electrical energy and distance heat service sectors. There are also additional tasks that relate to the operation of the system, such as to increase the security in the domestic supply system, to establish a simpler, faster and more accessible customer services system and to ensure that all of these services are met under the scope of the Government’s social responsibility program. The merit of the national public utilities model is that it should carry out the market activities on the basis of the comprehensive EU concepts and in harmony with the Government’s social policy plans. The system is able to represent and carry out its activities on the market and fulfil its non-profit concept concurrently because the main target of the asset production is not the acquisition of profit but the investment of that profit in order to extend and improve the services to meet the consumers’ needs. The Nemzeti Közművek ensures the unified control of the national public utility services. Licensed activities are carried out by the companies that are part of the Nemzeti Közművek. At present the Nemzeti Közművek provides a safe and continuous service for 4.2 million customers across the country.